We may be in a new year but still a lot of people out there who has or is using computer still do not know enough of what's inside the machine they are using. So i decided to do a post where the contents is 90% picture. A warning to all these post is intended to educate people who has little knowledge or do not have knowledge of the inner components of a simple desktop computer. If you want to learn or educate yourself then please by all means read and look on. 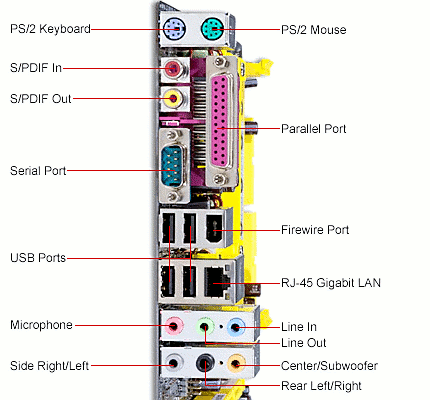 Below are the most basic parts of a computer hardware. There is a ton of different types of motherboard in the market. But all of theme if you look closely has the same identical parts only the color and position of those parts change. The central processing unit together with the Heat sink and Cooling Fan go hand in hand. The CPU will become hot as soon as you turn on the computer. To absorb the excess heat it needs the Heat Sink and to continue absorbing the heat generated by the CPU, it need the Cooling Fan. Without the heat sink and Fan the CPU would eventually burn-out due to the heat it generates while in operation. The RAM or Memory is another key components of the computer. These hardware parts must be compatible with the motherboard for it to work properly. Continue to Page 2 of the post.